22 May 2014, Keelung, Taiwan - Lian-Li Industrial Co. Ltd, today announces the release of two desk chassis – the single-system DK-01X and the dual-system DK-02X. Constructed of aluminum and combining the symbiotic relationship of desks and computer cases, these all-black hybrid chassis allow DIY builders to build a full computer inside a desk and show off their hardware creations through tempered glass desktops. The DK-01X and DK-02X feature a lockable sliding door to make installations and upgrades easy. The adjustable/removable keyboard tray makes typing and mousing comfortable, and the side mounted pocket with headphone rack allows users to easily store unused accessories. The DK-01X support motherboards up to HPTX. The DK-02X supports motherboards up to HPTX for its workhorse-oriented system side, and mini-ITX motherboards on the gaming-oriented side. DK-02X Interior. DK-01X is narrower & features room for only one system as standard. From air to water cooling, the DK-01X and DK-02X are ready to take on the latest cooling hardware. 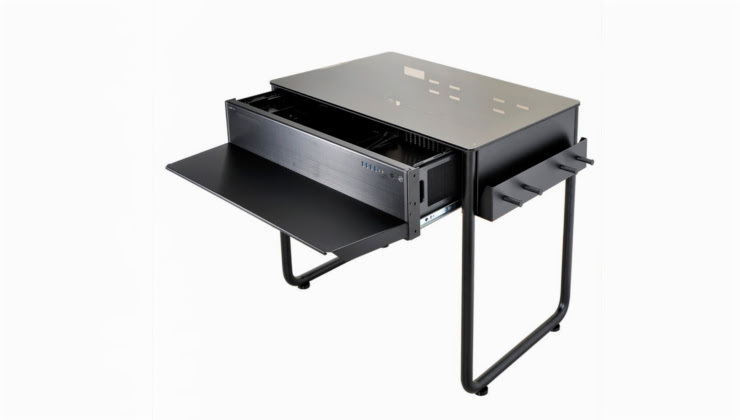 Both desk chassis support 360mm radiators on the side, and also have removable brackets on the front – the DK-01X has one 360mm bracket while the DK-02X has two 240mm brackets. The DK-01X has 10 individually removable hard drives bays, while the DK-02X has 8 HDD bays for the smaller system and 9 HDDs for the larger workhorse-oriented system. This storage setup gives builders flexibility to use the space as they see fit, such as freeing up more room for water cooling. Both desk chassis have a height of 805mm (31.7”), but can be raised to 835mm (32.9”) to provide more leg room. On the back, up to 3 monitor mounts can be installed for multiple display setups. CPU coolers up to 180mm (7”) in height and power supplies up to 280mm (11”) in length are supported. VGA cards up to 410mm (16.5”) inside the DK-01X and DK-02X. For both the DK-01X and the DK-02X, the I/O panel is located at the front side of the sliding drawer. The DK-01X front I/O includes four USB 3.0 ports and HD audio connections, while the DK-02X sports two sets of these same connections for both systems. Also, located on the front sliding drawer of the DK-01X and DK-02X is a slim optical drive bay, which can house an SSD. The DK-01X and DK-02X will be available in the UK at the beginning of August for the suggested retail prices of £599 and £729 respectively.